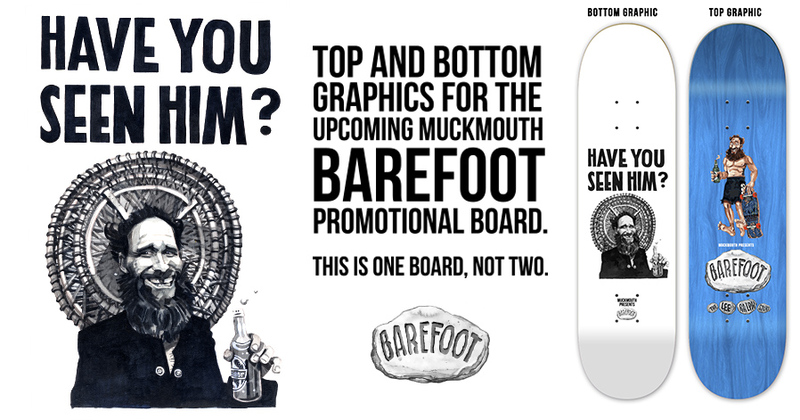 Ok guys and girls, this is where you'll (hopefully) get all the information for ordering one (or more) of the upcoming Muckmouth Barefoot promotional boards. Please note, there is only ONE style of board available, not two. This wonderful beast has both a top and bottom graphic and will look amazing hung both ways. Buy two and have twice the artwork. Hell, why not buy three and skate one as well? The bottom Animal Chin inspired graphic will be printed over a dark greenstone-esque wood stain, with the huge top graphic on blue. The middle ply will be orange to match Lee's beautiful red hair. Boards will be extremely limited, and are already in very high demand, so we highly recommend pre-ordering to avoid disappointment. These are on a first come, first served basis and once they are gone they are gone, so please don't hesitate. Boards will be available in 7.75, 8, 8.25, 8.5 and 8.75inch. Please also note, Lee is of course still very much sponsored by the mighty Pocket Pistols. This board is purely to promote the doco and give Lee fans something to hang or skate whilst they patiently wait for the film to be finished. Sorry again about the delay, it is coming, I promise. The boards are $80 New Zealand Dollars and can be shipped worldwide. The boards will be available in August but I will update via social media when we get an exact date.